ATD Pink Cycling Jersey - "It's Raining Cats and Dogs"
This Charming, Colorful, Jersey Will Make You and Your Little Cyclist HAPPY! A brilliant jersey to give your energetic child more reasons to ride! This gorgeous print was created in our factory, right here in our USA! Designed to give joy to children with the adorable cartoon images of friendly dogs and cats on a striking pink background. 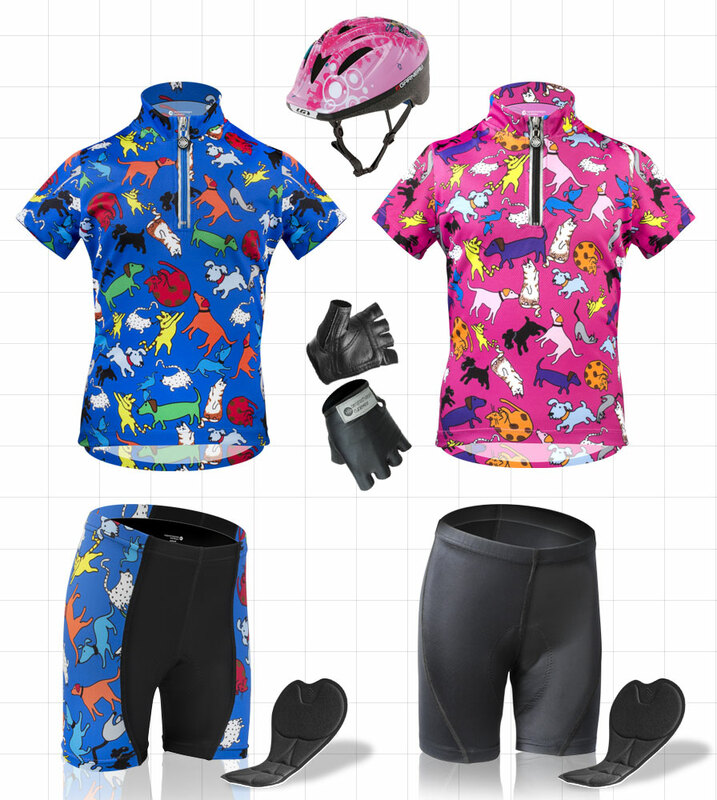 Match this children's designer imprinted bicycling jersey with matching "It's Raining Cats and Dogs" padded bicycle shorts. Team this bike jersey with a safety helmet and kid size padded bike gloves and your little cruiser will be pounding out the miles right beside you! Great features of the this bike jersey are: the wonderful, colorful, bright and fun imprint, a nice zipper with pull and reflective outline that really lights up in the dark, and super easy reach back pockets for their snacks and gear. Size Chart Below. See this Child's cycling Jersey in Blue! 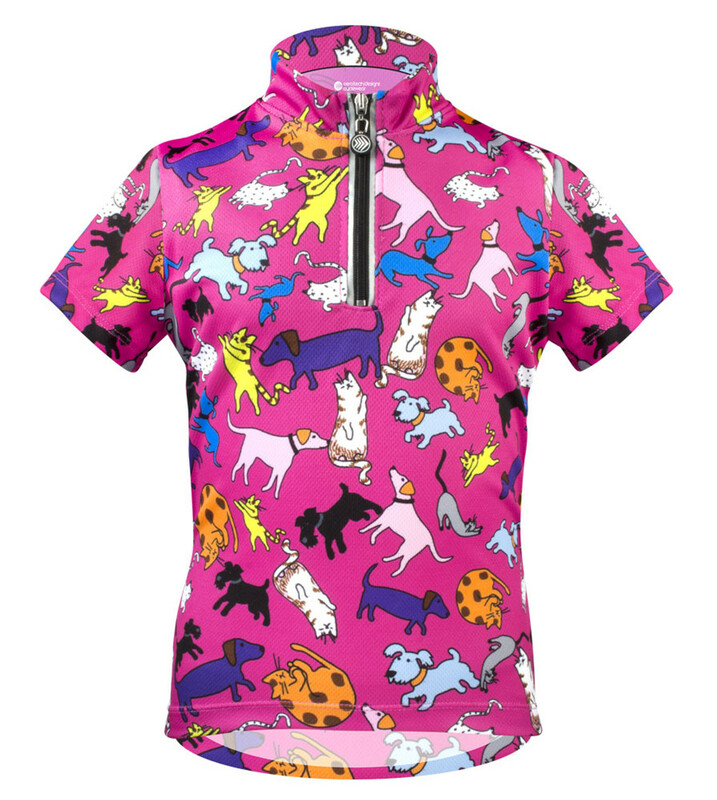 Match this children's designer imprinted bicycling jersey with matching "It's Raining Cats and Dogs" padded bicycle shorts. Team it with a safety bicycle helmet and kid size padded bike gloves and your little cruiser will be pounding out the miles right beside you in style and in comfort! Make it a set with "It's Raining Cats and Dogs" - Padded Bike Shorts. Comfortable to wear, easy to move in..
Suprise Your Princess with this Beautiful Pink Bicycle Jersey, You Will Both Love It! Gave this to my niece. It's really cute and a choice for biking. She loved it.